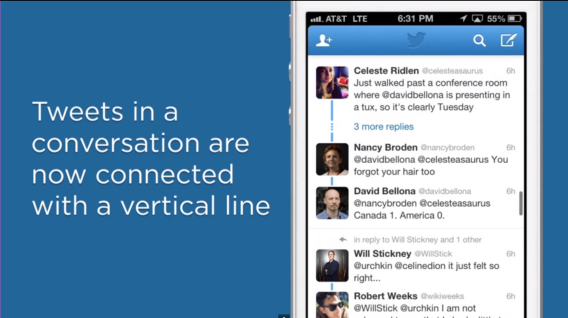 Twitter conversations: Why those confusing new blue lines actually make sense. Twitter now shows multiple tweets from a single conversation together in your timelines, highlighting instances in which people are actually talking to each other as opposed to simply shouting into the void. I was about to dash off a post blithely mocking Twitter’s decision to change the way it displays conversations between users. It was going to be headlined, “Twitter Changes Things All Around for No Reason, Confuses Everyone.” I was going to make some crack about how the Syrian Electronic Army must have infiltrated 1355 Market Street more deeply than anyone realized. I was going to invert Twitter’s cheerful assertion that “great conversations happen on Twitter every day” and “now they’re easier to find and enjoy.” More like “impossible to avoid,” amirite? I even had a funny-sounding verb lined up to characterize what the new vertical blue lines did to my Twitter timeline: “festoon.” My timeline had become festooned with vertical blue lines, I was going to complain. But then I went back and looked at the site again for evidence of said festooning. The evidence was scant. I had to scroll down relentlessly to find the first instance of a blue-vertical-line festoon marring my otherwise neatly chronological timeline. That’s when the rationale for Twitter’s seemingly indefensible switch-up struck me. The reason the festoons are few and far between is because hardly anyone holds actual conversations on Twitter. At least, that’s true in my timeline, which is full of techies, academics, journalists, politicians, and comedians, self-appointed or otherwise. Everyone’s too busy barking into their own megaphones to respond to anyone else. Either that, or they’re lurking passively in the faceless crowd, piping up only via the occasional timid retweet or favorite of someone else’s reverberating bark. That’s not universally true. There are people on Twitter who spend most of their time replying to other people’s tweets. Up to now, though, their contributions have been treated by Twitter as background noise. There are good reasons why conversations don’t show up in your timeline unless you follow at least two of the parties involved—and that won’t change under the new system. But under the old system, the fact that only the latest reply showed up in your timeline made conversations appear exclusive even when you were following both parties. It felt like you were constantly showing up late to an A/B conversation, and the polite thing to do was to C yourself out. On reflection, Twitter has decided that it would rather you butted in. Now, you see by default not only the latest reply but the context for it—the previous tweets in the thread from people you follow. Tap and you’ll get the full back-and-forth. Suddenly conversations between people you follow are the centerpiece of your timeline, taking aesthetic precedence over the one-liners by virtue of those blue festoons. And it feels like you’re wecome to join in. I first noticed the change after I replied to a tweet from AllThingsD’s Mike Isaac decrying tech writers’ tendency to tell readers why a given company’s every move “makes sense.” I pointed out that I don’t always say that—I haven’t seen Zynga do anything that made sense in years. Then my colleague Farhad Manjoo chimed in, and suddenly I found myself distracted by those vertical blue bars. 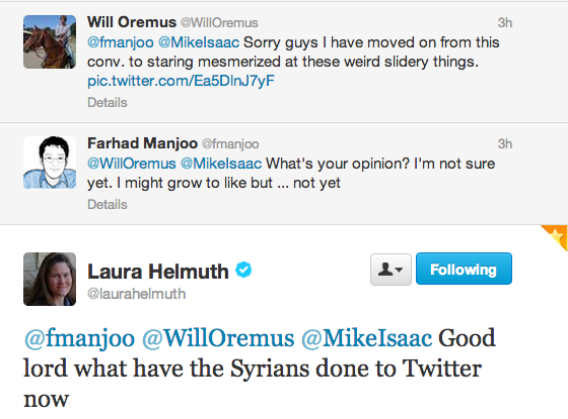 My colleague Laura Helmuth, encouraged no doubt by the festoons, jumped in with the Syrian Electronic Army joke—yes, I had been planning to steal it without attribution—and for a moment it felt like we were all present, holding an actual conversation. You may fairly point out that Twitter’s problem has never been a dearth of journalists chirping insufferably among themselves. But of course this change doesn’t apply only to us insufferable journalists. It is also likely to lead to more serendipitous exchanges between famous authors, brutal smackdowns between warring comedians, and better still, people you actually know and enjoy in real life. Thanks to those blue vertical lines, my eye immediately alighted on a conversation between two friends who I’d never realized were acquainted one another. For all its virtues as an RSS reader, real-time news board, and virtual water cooler, Twitter has never excelled as a platform for connecting with family and friends. The new emphasis on conversations could help to change that. If nothing else, it will privilege tweets that spark discussion over those that don’t. It was Manjoo, come to think of it, who best summed up the phenomenon in which people initially “hate” every change to any website that they regularly use, and then quickly get over it. Even Twitter’s own U.K. director admits that the new conversations drove him crazy for a week before he came around. But in this case, I underwent that transition so fast that, by the time I finished my blog post ripping Twitter conversations, I already disagreed with myself. So, with apologies to Mike Isaac, the new Twitter conversations make sense. And if you want to argue with me about that, you know where to find me.